Years ago I struggled with a product molded in nylon, and though we received it in 25 kilo bags, closer inspection revealed that almost 25% of the bags had been punctured and re-taped upstream by either the shippers or our own material handlers. As you know, it doesn't take much exposure to moisture for this material to get too "wet" to process. I dried everything, even right from the bag. Punctured bags received from our supplier were rejected and returned. Also, it was a requirement to load the whole bag into a dryer. No open bags were ever saved. And at the end of a run any remaining material was discarded if it remained in the dryer more than 4 hours after stopping the press. "Overcooking" this resin will degrade it rapidly. More of interest to me is the fact that the problem worsens when transfer over to an operator. So, a few questions. How are the inserts handled? 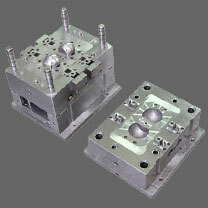 Is an injection mold release spray used to help de-mold the bowl? If so, are all operators using the same release agent? And in the same quantity and frequency? I'm assuming the inserts are stationed on the operator's work bench. Is the bench used to do any type of secondary processing that would introduce a chemical or other agent that could be transferred to the inserts? What is the cycle time expected, and what do you observe between operators? Oh, it occurred to me that these may be single use inserts that remain in the part and used to fasten the bowl to a mating component. Another story from years ago, we insert molded a syringe gun that used a steel insert that acted as a piston. The rods were purchased bulk, pre-cut to length. When we received them, they were cleaned with acetone and allowed to sit in the acetone "bath" until used. The acetone penetrated into the steel insert resulting in cracked parts around the insert that sometimes did not appear for several minutes after de-molding. Bottom line, it sounds to me more like a design issue and the fact that an established process to handle inserts has not yet been developed. So, was a mold flow analysis performed? And have you documented your personal process for the operators to follow? And, do you have the time to perform a screening DOE to determine main effects?